I’ve had the pleasure of reviewing three mobile Xbox Live physics puzzlers so far: iBlast Moki, Tiki Towers, and Enigmo. Now that IUGO’s popular Implode! 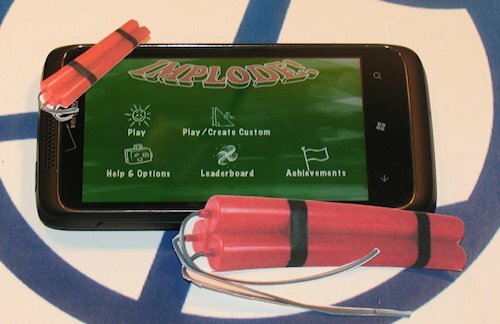 has come to the Windows Phone, could the genre be getting too crowded for its own good? That depends on how much you like a cerebral challenge. After braving Implode!’s vast quantity of levels, I’m pleased to report that my brain has yet to be tapped out. More importantly, Implode! is good enough and different enough to justify its place on the platform. Put on your hard hat and head past the break for our full review. Implode! takes place in a classroom setting. 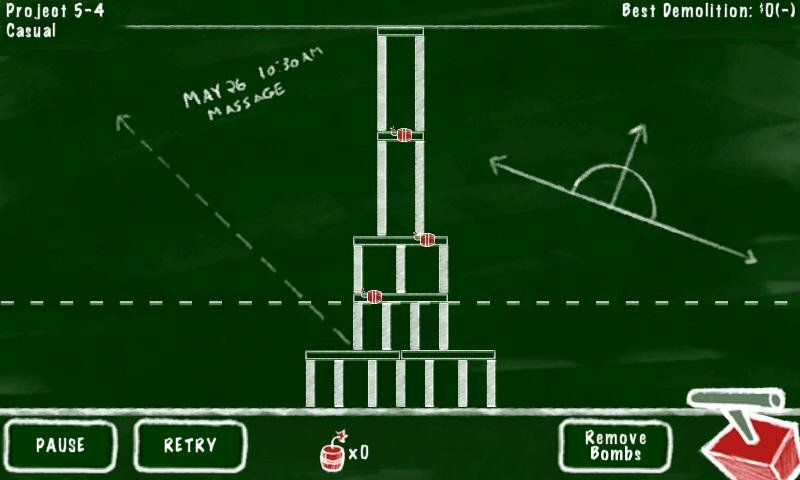 Each puzzle is presented as a chalkboard drawing, as if the instructor had set up a challenge and asked the player to solve it. The chalkboard aesthetic may not impress from a technical standpoint, but it’s simultaneously unique and nostalgic. Puzzles are often littered with little scribbles and drawings off to the side, just like kids might do when the teacher leaves the room for a few minutes. While Implode! lacks music like IUGO’s previous Xbox Live title, Zombie Attack! 2, the developer at least included ambient audio in its place. Classroom sounds don’t complement the experience as much as catchy tuneage would, but they do fit the game’s theme well enough. Each puzzle consists of an assortment of blocks stacked together into a structure. Players receive a limited number of explosives in order to knock down said structure. Bombs must be placed on the blocks themselves, and only one bomb to a block. Colored-in blocks can’t have bombs placed on them, though nearby bombs do receive a proximity scoring bonus. Once you’re satisfied with the bomb placement, press the detonate button and watch the reaction unfold. Speaking of bomb placement, the game automatically provides a magnified view of the surrounding area while the player moves a bomb around. This can be helpful, but it sometimes blocked parts of the screen that I needed to see. One zoomed in intersection of blocks may look just like another, resulting in bombs getting put on the wrong spot. While you can zoom in or out the entire playing field with the usual pinching motions, the magnifier still shows up no matter the zoom level. I would have liked the ability to turn the magnifier off, but it’s only a minor annoyance. Most of Implode!’s challenge comes from trying to cause the wreckage to fall below a certain height, represented by a dotted line. If anything touches or rises above that line, even a little, you fail the level. It takes smart bomb placement – knocking blocks far away from each other or breaking problem blocks apart – to knock things down far enough to succeed. Passing a level is one thing, but receiving an A+ on it is another. Each level has a score target that must be reached in order to score the highest grade. Since many of the Achievements involve A-pluses, you’ll want to aim high grade-wise. 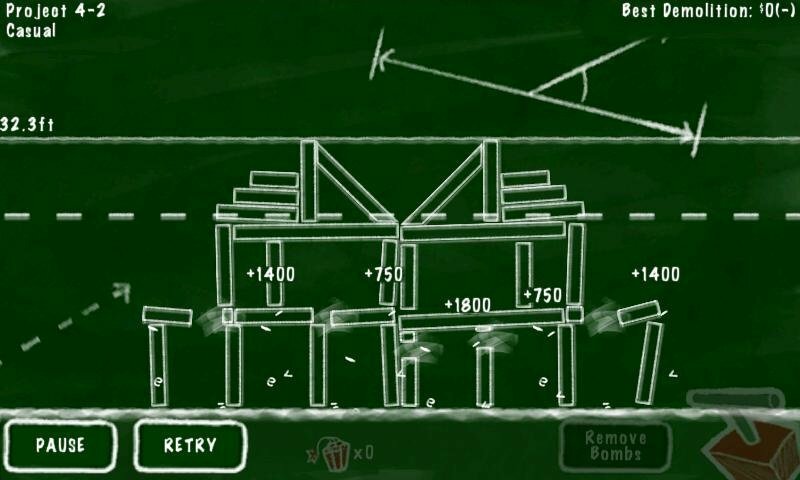 A number of factors contribute to score, including bomb placement, the number of bombs used, the height of the wreckage, and difficulty. Bombs net more points when they do off near block intersections and colored-in blocks, so positioning them wisely can earn a lot of points. But unused bombs also get you points, so using less bombs is often key. Fine-tuning a passing setup until it becomes an exemplary one is part of the fun. Players can toggle between three difficulties at any time: Casual, Veteran, and Expert. The lower the difficulty, the higher the dotted passing line on the screen. People who just want to pass the levels and don’t care about Achievements or mastery can get by fine on the lower difficulties. But if you want the A+ rank, you usually have to play on Expert. See, higher difficulties carry a score bonus, and the Expert bonus is usually essential to achieving the best grade. As we all know, if you don’t earn good grades, you’ll just end up flipping burgers for the rest of your life, so jack up that difficulty and practice hard! Dynamite: The standard tool, with a small, circular blast radius. Keg Bombs: With a huge blast radius, these tear buildings to shreds. They also provide a high point bonus when unused, so sticking with less valuable bombs is sometimes in order. Directional Bombs: These explode in a specific direction and provide a low unused bomb bonus. Gravity Bombs: Appearing only late in the game, Gravity Bombs pull blocks in instead of pushing them out. They can slingshot a large blocks or two off-screen when placed properly. Glass buildings: People who live in glass houses shouldn’t throw bricks, and by the same token, neither should players knock bricks into those houses. If any piece of debris touches glass buildings, you fail the level. These are some of the toughest puzzles in the game, with 5-2 giving most players a tough time early on. It’s hard enough to beat a glass building level without hurting the building, but 5-2’s A+ score requirement is just way too strict. The same applies to a few similar levels later on. Water: Demolition experts must be conscious of environmental damage, and so knocking blocks into the water is prohibited. Since water only rests at the bottom of the screen, it’s less of an impediment than glass buildings. Wind: Represented by curly lines in the background, wind affects the direction that objects fall. I seldom noticed its effects though. Low gravity: Another hard-to-detect effect, low gravity only pops up near the end of the game. Boulders: Blocks can get stuck on these indestructible objects, making the debris pile higher than desired. Implode! includes an amazing 150 levels, broken up into 15 sets of 10. Each set has a theme, the most notable being the holiday set, in which yuletide graffiti decorates each puzzle. Completing six or so puzzles in one set unlocks the next set, so players can move on to another batch of levels if they get stuck. Mastering all those levels will take several hours. As if that wasn’t enough, players can even create their own puzzles with the game’s built-in editor. You just create pieces by tapping and dragging them, then stretch, rotate, and place them as needed. Making levels isn’t for me, but I can see others having fun with this feature. Sadly, custom levels can’t be shared with others. The developer initially planned to include the feature (as evidenced by the Achievement list that leaked in January), but it didn’t make the cut (presumably due to Microsoft’s well-known aversion to sharing custom content in games). Zombie Attack! 2’s Achievements were extremely tedious to go after, so I was a bit worried about how Implode!’s would play out. Thankfully, the game itself is much better built for portable play, with short levels that can be defeated in under a minute (though the tougher ones take a lot longer to solve). What’s more, the Achievements are well-integrated into game’s structure. They’re based around completion and A+ milestones, and there are a lot of them. It feels like there’s always one just around the corner, which provides a great incentive to complete just a few more puzzles. On the other hand, Implode! is still a physics puzzle game, in which a lot of variables must be overcome in order to beat and perfect levels. Like every other game in the genre, players are bound to get stuck on the occasional level, with little hope of solving it on their own. But unlike iBlast Moki and Enigmo, YouTube isn’t crawling with helpful videos for this game. Thankfully, BeatImplode.com and the Xbox360Achievements.org forums are great resources for solutions. Implode! may not be much of a looker, but what it lacks in fancy visuals it more than makes up for with quantity. The sheer number of levels with so many different kinds of bombs and obstacles kept me challenged and entertained throughout. While a few levels’ scoring requirements seem unbalanced, on the whole the game is very well-designed. Puzzles fans can happily buy this game and start bringing down the house.